Pittsburg Police Chief Mendy Hulvey has announced her retirement effective June 29, 2018. Hulvey has served 17 years with the department. Hulvey began her law enforcement career in 1985 as a police officer in her hometown of Columbus, Kansas. While serving at the Columbus Police Department, she was promoted to sergeant. She left Columbus to attend graduate school at California State University, in San Bernardino, California. Following graduate school, she returned to Kansas, where she served as a patrol officer with the Pittsburg Police Department in September of 2000. She earned a promotion to Administrative Sergeant in 2001, and was appointed the Deputy Chief of Police 2002, serving alongside Pittsburg Police Chief Michael O. Hall. Upon Chief Hall’s retirement in 2004, Mendy was promoted to Chief of Police by then City Manager Allen Gill. She was instrumental in promoting the public safety sales tax, which funded the state-of-the-art Beard-Shanks Law Enforcement Center. She also promoted the establishment of another public safety sales tax, which has allowed for a much-needed expansion of personnel, technology and equipment for the police department. 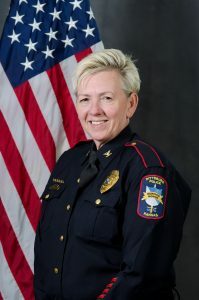 Throughout her career as Police Chief, Hulvey obtained numerous grants, including a key grant, which enabled the department to fill three unfunded officer positions left vacant due to the financial fallout during the Great Recession. Additionally, Hulvey was responsible for creating the Pittsburg Police Department’s annual Citizens Academy, an educational program that allows residents, workers, and students the opportunity to learn about the functions of the police department firsthand. Chief Hulvey has served on the Salvation Army Board of Directors, Children’s Advocacy Center Board of Directors, Elm Acres Youth Services Board of Directors, and has served on the Juvenile Corrections Advisory Board both locally and at the State level. Chief Hulvey has also served for many years on Grant Advisory and Review Committees through the Kansas Attorney General’s Victims Services Office. Hulvey holds a Bachelor’s Degree in Criminal Justice from Missouri Southern State University, and a Master’s Degree in Criminal Justice from California State University, San Bernardino, California. She is a graduate of the Federal Bureau of Investigations Central State Law Enforcement Executive Development program. She is also a graduate of the Federal Bureau of Investigations prestigious National Academy program.